The Grand View Vikings broke away from a 30-30 deadlock at halftime Monday night and defeated Mount Mercy, 76-62, in a Heart of America Conference women's basketball game at the Hennessey Recreation Center. Grand View outscored the Mustangs, 25-14, in the third quarter to take control of the ballgame. Sharice Kawakami led Mount Mercy (5-11, 1-9) with 19 points. Audrey Mulumba finished with a double-double with 10 points and 10 rebounds. 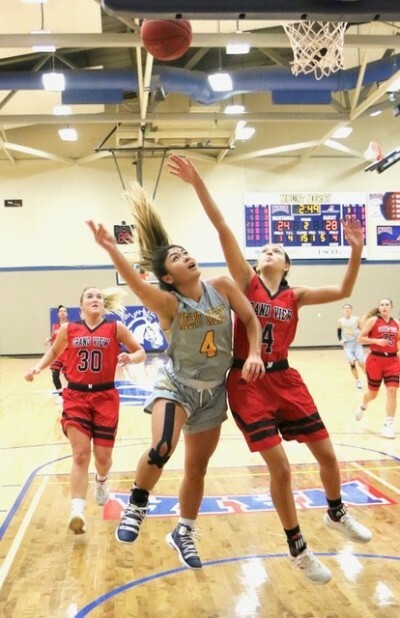 The Mustangs played without Brianna Thomas, their leader scorer at 14.4 points who has been sidelined for not meeting all of her school requirements. Bailee Arnburg scored 17 points for Grand View (7-10, 5-6). The Vikings made 15 3-pointers, compared to five for Mount Mercy. GRAND VIEW (72): Voss 0 0-0 0, Pisney 3 0-0 8, Danielson 1 0-0 3, Sickles 3 0-0 8, Arnburg 7 1-3 17, Jamison 1 2-2 5, Trautsch 2 0-0 6, Rosener 2 0-0 4, Garrison-Nickerson 2 1-2 5, Carr 0 0-0 0, Bertman 0 0-0 0, Willert 3 0-0 9, Campbell 4 1-2 11. Totals 28 5-9 76. MOUNT MERCY (62): Moffett 2 5-6 9, Kawakami 7 3-4 19, Goodman 2 1-1 6, Lampe 2 0-0 5, Mulumba 4 2-2 10, Kitterman 0 0-0 0, Sheck 0 2-2 2, LeGrand 3 0-0 7, Brown 2 0-0 4. Totals 22 13-15 62. Halftime - Mount Mercy 30, Grand View 30. 3-point goals - Grand View 15 (Willert 3, Pisney 2, Sickles 2, Arnburg 2, Trautsch 2, Campbell 2, Danielson 1, Jamison 1), Mount Mercy 5 (Kawakami 2, Goodman 1, Lampe 1, LeGrand 1).